I, along with my husband, went to district Chamba Anchal Chowari, Himachal Pradesh.This was our first experience to visit the homes, the family of our whole time workers. Chowari is situated in a valley. All around Chowari are the mountains, lush green. But the schools and our workers are in the small villages on the mountains. We went to visit the pit that would produce organic manure in one of our workers home. The village was only 20km from Chowari but it took us 1.30 hrs to reach there. From the road the village was 1/2km away and to reach there we had to walk on foot. From that we could see that what the difficulties are there for our workers. Buses ply on these mountains but have specific timings. We have 150 schools running right now and 90 are in progress. One worker can only visit 1or 2 schools in a day, though we had our own vehicle, we could see only 1 school. While visiting their homes I noticed many things, how their small homes and surroundings are neat and clean. They have mirrors in their room but it was covered, not in one house but in all the houses. These things are grandmother use to tell us but we ignore it. Now we do it because Vastu Shastra tell us. 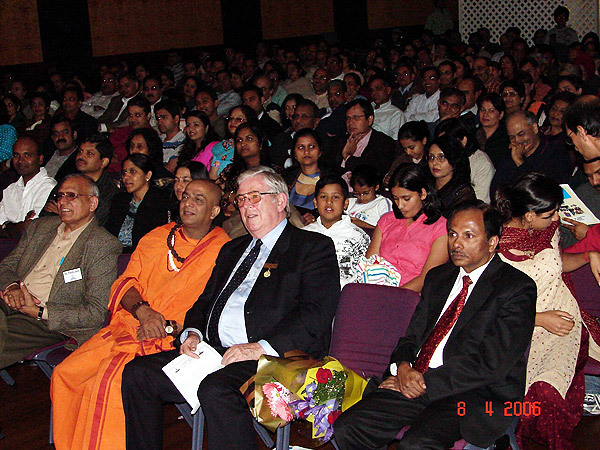 Swami Satchidanada EVF global Secretary had gone to Australia to attend the Annual Function of EVF Australia, on April 8, 2006 in Sydney and on 9th in Melbourne. 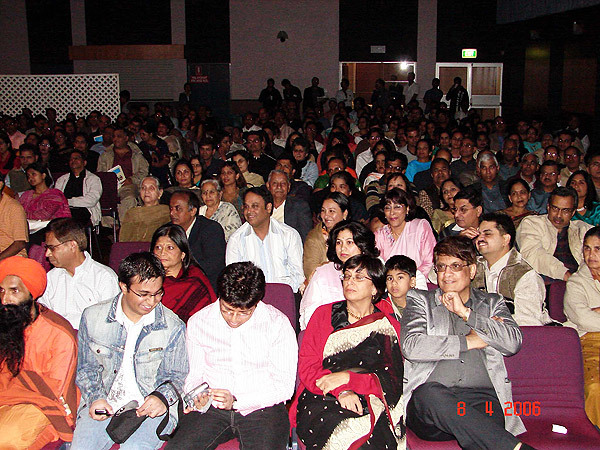 Hasya Kavi Dhamaka by Arun Gemini and Sailesh Lodha were organized in Australia. It was a grand success and the show went houseful, They got good responses. With this programme EVF Australia's Melbourne Chapter working started and the opening of the chapter will be announced soon. 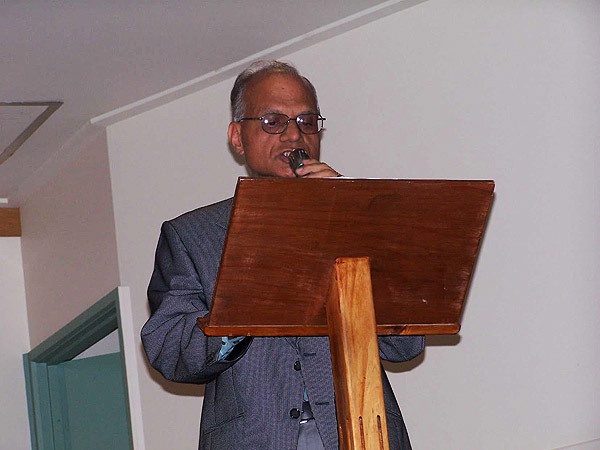 In New Zealand , Auckland, Hamilton and Rotorua organized good meetings, where Sri Sanjay Joshi in Hamilton accepted to take the Ekal works and soon EVF New Zealand will start functioning with a new committee. In Hong Kong, people have got the registration of EVF Hong Kong. There was a Meeting held on 18th April at Holiday Inn with Sri B. K. Gupta, who is an Indian consulate General, Sri D. K. Patel and Mrs Meera Mathani, daughter of 'Big Hoteliars Hiraleela Group'. Ekal Vidyalaya Foundation of Hong Kong is planning to launch Foundation formally in the first week of July 06. On Akshaya Tratiya day on 30th April’06 an innovative awareness campaign was organized in Bhopal. 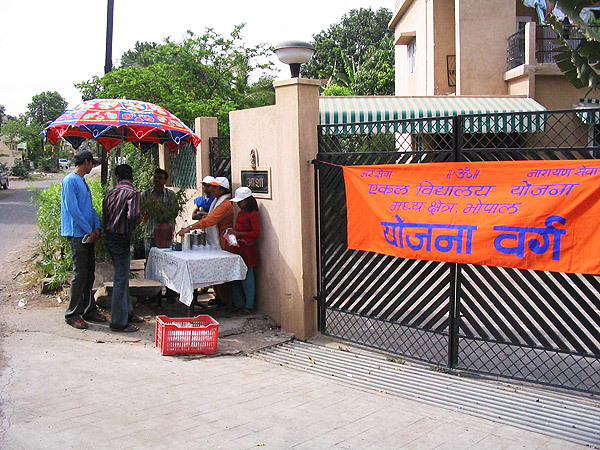 A small stall (Ekal Pyaaoo) was erected on the street and home made raw Mango juice was served to all passers-bye. They were apprised about the Ekal Vidyalaya Movement. Many including youngsters and students showed lot of interest. A handsome amount was collected through voluntary donations. Even the kabaadiwallahs (Vendors buying old and used goods for recycling) gave contributions. Service of cold beverage in the hot summer was widely appreciated by people. The awareness campaign was conceived and executed by Shrimati Asha Shukla, Prabhari Samrakshak Pariwar with the help of Shri Ramniwas and some youngsters. The National Mahila Nagar Sangathan Varga is to be held on July 15 & 16, 2006 at Bangalore (Karnataka, India). All of ladies related to Ekal Movement are cordially invited to attend the Meet. Akshay Tritiya is the third day of the bright fortnight of Baisakh. It is believed that this day marks the beginning of the "Satya Yug (era)", the first of four yugs -- Satya, Treta, Dwapar and Kali. This year Akshay Tritiya fell on 30th April, 2006. The day of Akshay Tritiya is a very auspicious day. People worship, do lot of charity. It is said that knowledge gained or charity done on this day is very fruitful. It is considered to be very lucky day to start new business or venture. Many people buy gold or property on this day. Fasts are kept on this day and poojas are performed. In charity, fan, rice, salt, ghee, sugar, vegetables, tamarind, fruit, clothes, are given. Lord Vishnu is worshipped on this day. It is said that it was the day of Akshay Tritiya, that Vedvyash along with Lord Ganesha started writing the Mahabharata. In Bengal, on the day of the Akshay Tritiya, "HalKhata" or ceremony to start the new audit book is performed -with the worship of Lord Ganesha & Devi Lakshmi. Bengalis perform many rites and rituals on this day. This day is also most auspicious day for the Jat farming community. It is known as "Akha Teej". Early morning, a male member of Jat family goes to field with shovel. All the animals and birds encountered on the way to the field indicates omen and predictions for rains and crops. Akshay Titiya is also an occasion for weddings, which are conducted in mass marriage ceremonies. It is considered an unboojha muhurat.